This page has recently been added. Please help by proofreading. If you find any issue that needs changing, click "Edit me on GitHub" on the top right corner of this page and add your suggestions. For more information, see Contribute. For help, ask in #typo3-documentation on Slack (see https://my.typo3.org/index.php?id=35 to register). Usually, git does a good job of merging several changes in one file. However, there are occasions where git does not know what to do, because one change conflicts with another, meaning there are more than one possible way to merge. Use a combination which you manually combine. Git cannot resolve this automatically, because it is ambiguous. What should the result be? Load your patch page in the browser. Open one of the ReviewSprint views on Forger. In that case, you will need to resolve the conflicts in some way. See next section How to resolve conflicts? 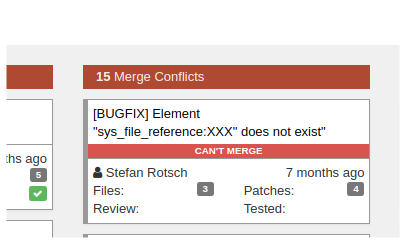 for more information about resolving merge conflicts. Some git commands will show you that there are conflicts e.g. git cherry-pick, git rebase, git pull --rebase etc. It will have inserted markers in the files and ask you to resolve them and then continue. You must resolve the conflict for all these files. There are several ways to do this. Most editors or IDEs assist you in doing this. Check the information for your IDE. Identify files with conflicts: the git commands usually show which files have conflicts, also your Editor or IDE should show you (PhpStorm does). $ > You are currently cherry-picking commit 805a207. All files shown with "both modified" will need to be attended to. If you want to do it manually, look for all occurrences of <<<<<<<. End of conflict: >>>>>> and then name of branch version 2. There may be more than one conflict in a file! In most cases, git will have told you what to do when it showed the conflict.